Pre-Requisites: Access Expert Level 28 strongly recommended, as you should watch all of my classes in order. However, if you're skipping around, you should have at least completed the Beginner series and the first 3 or 4 levels of the Expert series where I start to cover functions. This is part 5 of the Comprehensive Guide to Access Functions. We will be learning many new Aggregate and Domain Aggregate (Lookup) functions in today's class. We will start with the basic aggregate functions: Sum, Avg, Count, Max, Min, First, Last. We will see how to use them in a form footer, and an aggregate query. Next we will learn about Domain Aggregate functions, also called Lookup Functions. These include DLookup, DMax, DMin, CSum, DCoun, DAvg, DFirst, and DLast. We will spend some time covering the different types of criteria for these functions, which is a major source of headache for many users. Next we go over a bunch of different examples using the lookup functions. 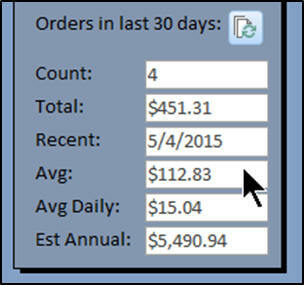 We will see how to display your order totals for the past 30 days, how to read values out of the system default values table, how do display the date of the last order placed, how to show the average order value, how to forecast future sales, and more. Next we will cover a topic that tons of people have asked me about: how to create your own counter field in Access. Many people want to have a number that automatically increments, but they don't want to use an Autonumber, for a variety of different reasons. So in this lesson, I'll show you how to create your own ID field and have it automatically count up from whatever the largest current ID field is, so you can start it at 1000 and the next number would be 1001, for example. The next example is also highly requested. You will learn how to display running balances (or running sums) in your Access forms and reports. Creating a running sum in a report is relatively easy, but unless you know how to use the domain aggregate functions, it's impossible to do with forms - but I'll show you how. Finally, we'll finish up with another popular request: how to recreate Excel's VLOOKUP function in Access. In Excel, if you want to look up a value in a table that has a RANGE of values, you can use VLOOKUP. Access doesn't have an equivalent function. For example, let's say you're looking up student grades. Your lookup table might have 0, 65, 70, 80, and 90 in it, and you want to be able to look up, say, 87, but you don't want to specify every possible grade from 0 to 100. So we can use a combination of domain aggregate functions to duplicate VLOOKUP. This is the 29th class in the Access Expert series. This is the fifth class in my Comprehensive Function Guide series. If you're serious about building quality databases with Access, don't miss out on this course. Of course, if you have any questions about whether or not this class is for you, please contact me. 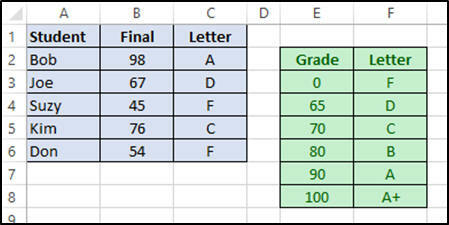 Assign "A" for Grade 90, etc.